Have you ever wondered if your dough has actually doubled? Is your kitchen too cold for your dough to rise? Don't have a Dutch oven for baking artisan bread? These hacks have worked great for me. I sometimes (often) forget how large my dough was prior to the first rise, especially when there is a long rising time. I love using large rubber bands and Cambro containers to mark either where the dough started out, or where the dough is supposed to end up. 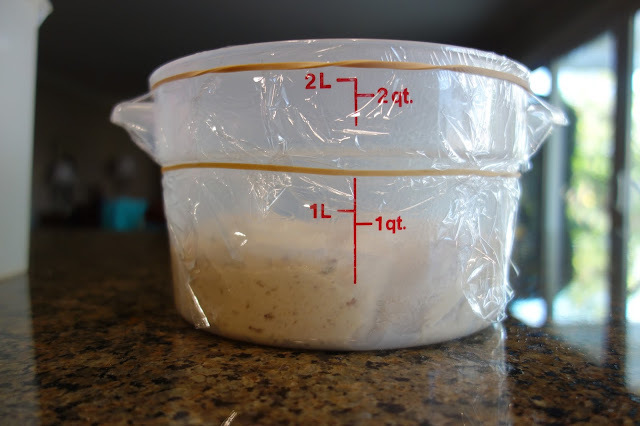 If you don't have the large rubber bands, or if your container is too large, using tape to mark either the starting or ending point is also good, especially when using a flat rectangular container. I know this sounds simple, but you'd be amazed how helpful it is to have this as a reminder. Bread baking involves a lot of down time, which means, you can easily forget some of the details. Trust me. Hack #2 - Is your kitchen too cold for your dough to rise? Don't have a Brod and Taylor Bread Proofer? No worries. 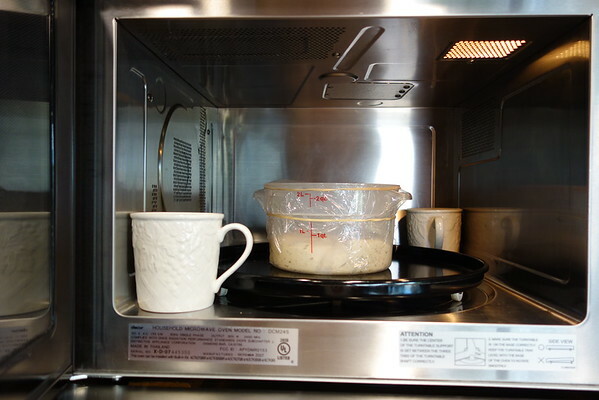 Just place two coffee cups filled with water in your microwave and cook for two minutes. Place each cup in opposite corners, place the dough in the middle, and shut the microwave door. This creates a warm, moist environment for your dough. I especially love using this hack in the winter. Hack #3 - Don't have a Dutch oven for baking artisan bread? There is a lot of lore about using a preheated Dutch oven for baking bread, however, you don't really need one. 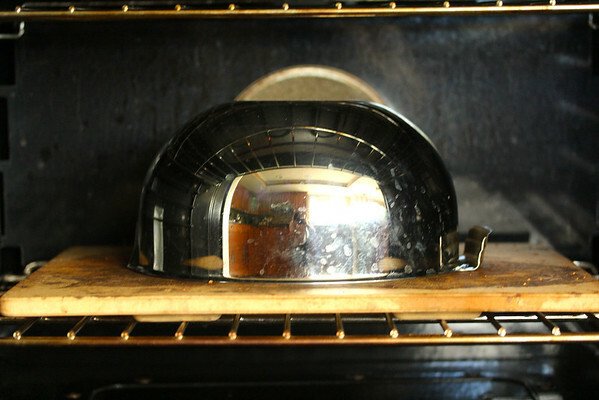 You can use an upside down stainless steel bowl over a baking stone, or even a large stainless bowl over a baking sheet. It's the dough in an enclosed space that creates the steam, not the magical powers of the Dutch oven. Yes, cast iron or clay Dutch ovens may hold their heat a bit longer, which will help you as you are transferring your loaf to the oven, but in a pinch, try this hack. What simple and wonderful hacks. I'm not much of a bread-baker, so they are perfect for me. Thanks. I love the color of your stone, Karen. It's getting that nice rich deep hue! Thanks for these hacks--I use my bread machine for dough since it keeps the temp much better than my crazy hot-in-summer-cold-in-winter kitchen!